KENNEDY SPACE CENTER, FL – A stunningly beautiful nighttime launch mesmerized delighted spectators as it roared off a Florida space coast launch pad late Tuesday night, March 22, on a mission for NASA stocked with over three tons of science and supplies bound for the multinational crews working aboard the International Space Station (ISS). A United Launch Alliance (ULA) Atlas V rocketed raced to orbit from Cape Canaveral Air Force Station, Fl, carrying an enlarged Cygnus commercial resupply spacecraft on the Orbital ATK CRS-6 mission to the ISS. The venerable Atlas V lifted off right on target at 11:05 p.m. EDT from Space Launch Complex 41 into a picturesque moonlit sky that magnificently illuminated the scattered thin clouds hovering over the seaside launch pad for the hordes of excited folks and families lining the beaches and lucky to witness what may be history’s last launch of a Cygnus from Florida. Future liftoffs of the private Orbital ATK Cygnus supply truck designed to stock the station will return to their original launch site on Virginia’s eastern shore starting with the next mission for their NASA customer sometime this summer. Cygnus launches to the ISS normally start from NASA’s Wallops Flight Facility in Virginia. But a catastrophic failure of the Orbital ATK Antares rocket moments after liftoff on Oct. 28, 2014, forced Orbital to seek and book an alternative launch vehicle while the company redesigned and reengined Antares first stage with new powerful powerplants for the ride to orbit. The Cygnus spacecraft will arrive at the station on Saturday, March 26, at which time Expedition 47 Commander Tim Kopra of NASA and Flight Engineer Tim Peake of ESA (European Space Agency) will grapple Cygnus, using the space station’s robotic arm, at approximately 6:40 a.m. NASA TV coverage of rendezvous and grapple will begin at 5:30 a.m. The commercial Cygnus cargo freighter was built by Orbital ATK, based in Dulles, Virginia. The Cygnus has been named the S.S. Rick Husband in honor of Col. Rick Husband, the late commander of Space Shuttle Columbia, which was tragically lost with its crew of seven NASA astronauts during re-entry on its final flight on Feb. 1, 2003. This flight is also known as OA-6 and is being launched under terms of the firm’s Commercial Resupply Services (CRS) contract with NASA. It also counts as Orbital ATK’s fifth cargo delivery mission to the space station. OA-6 is loaded with 3513 kg (7700 pounds) of science experiments and hardware, crew supplies, spare parts, gear and station hardware to the orbital laboratory in support over 250 research experiments being conducted on board by the Expedition 47 and 48 crews. About a quarter of the cargo is devoted to science and research gear. The cargo includes 3279 kg of science investigations, 1139 kg of crew supplies, 1108 kg of vehicle hardware, 157 kg of spacewalk equipment, and 98 kg of computer resources. – Strata-1, designed to evaluate how soil on small, airless bodies such as asteroids behaves in microgravity. – Meteor, an instrument to evaluate from space the chemical composition of meteors entering Earth’s atmosphere. The instrument is being re-flown following its loss on earlier supply missions. – Saffire, which will set a large fire inside the Cygnus in an unprecedented study to see how large fires behave in space. The research is vital to selecting systems and designing procedures future crews of long-duration missions can use for fighting fires. – Cygnus is carrying more than two dozen nanosatellites that will be ejected from either the spacecraft or the station at various times during the mission to evaluate a range of technology and science including Earth observations. When the ISS Expedition 47 crew members open the hatch, they will be greeted with a sign noting the spacecraft was named ‘SS Rick Husband’ in honor of the STS-107 mission commander. Cygnus will spend approximately two months docked at the ISS. Watch for Ken’s onsite launch reports direct from the Kennedy Space Center in Florida. The longest space mission in history by a female astronaut is now set to conclude on Thursday, following Russia’s confirmation of a significant reshuffling of the crew and cargo flight manifest to the International Space Station (ISS) for the remainder of 2015 – all in the wake of the unexpected Russian launch failure of a station bound Progress resupply ship in late April with far reaching consequences. The record setting flight of approximately 200 days by Italian spaceflyer Samantha Cristoforetti, along with her two Expedition 43 crewmates, will come to an end on Thursday, June 11, when the trio are set to undock and depart the station aboard their Russian Soyuz crew capsule and return back to Earth a few hours later. NASA TV coverage begins at 6 a.m. EDT on June 11. Roscosmos, the Russian Federal Space Agency, officially announced today, June 9, a revamped schedule changing the launch dates of several upcoming crewed launches this year to the Earth orbiting outpost. Launch dates for the next three Progress cargo flights have also been adjusted. The next three person ISS crew will now launch between July 23 to 25 on the Soyuz TMA-17M capsule from the Baikonur cosmodrome in Kazakhstan. The exact timing of the Expedition 44 launch using a Russian Soyuz-FG booster is yet to be determined. Soon after the Progress mishap, the Expedition 43 mission was extended by about a month so as to minimize the period when the ISS is staffed by only a reduced crew of three people aboard – since the blastoff of the next crew was simultaneously delayed by Roscosmos by about two months from May to late July. Indeed Cristoforetti’s endurance record only came about as a result of the very late mission extension ordered by Roscosmos, so the agency could investigate the root cause of the recent launch failure of the Russian Progress 59 freighter that spun wildly out of control soon after blastoff on April 28 on a Soyuz-2.1A carrier rocket. The Expedition 43 crew comprising of Cristoforetti, NASA astronaut and current station commander Terry Virts, and Russian cosmonaut Anton Shkaplerov had been scheduled to head back home around May 13. The trio have been working and living aboard the complex since November 2014. The 38-year old Cristoforetti actually broke the current space flight endurance record for a female astronaut during this past weekend on Saturday, June 6, when she eclipsed the record of 194 days, 18 hours and 2 minutes established by NASA astronaut Sunita Williams on a prior station flight back in 2007. Cristoforetti, of the European Space Agency (ESA), also counts as Italy’s first female astronaut. The Progress 59 cargo vessel, also known as Progress M-27M, along with all its 2.5 tons of contents were destroyed during an uncontrolled plummet back to Earth on May 8. Roscosmos announced that they are accelerating the planned launch of the next planned Progress 60 (or M-28M) from August 6 up to July 3 on a Soyuz-U carrier rocket, which is different from the problematic Soyuz-2.1A rocket. Following the Soyuz crew launch in late July, the next Soyuz will blastoff on Sept. 1 for a 10 day taxi mission on the TMA-18M capsule with cosmonaut Sergei Volkov and ESA astronaut Andreas Mogensen. After British opera singer Sarah Brightman withdrew from participating as a space tourist, a new third crew member will be named soon by Roscosmos. The final crewed Soyuz of 2015 with the TMA-19M capsule has been postponed from Nov. 20 to Dec. 15. Also in the mix is the launch of NASA’s next contracted unmanned Dragon cargo mission by commercial provider SpaceX on the CRS-7 flight. Dragon CRS-7 is now slated for liftoff on June 26. Watch for my onsite reports from KSC. The Dragon will be carrying critical US equipment, known as the IDA, enabling docking by the SpaceX Crew Dragon and Boeing CST-100 astronaut transporters – due for first crewed launches in 2017. NASA astronaut Scott Kelly and Russian cosmonauts Mikhail Kornienko and Gennady Padalka will remain aboard the station after the Virts crew returns to begin Expedition 44. SpaceX Dragons seem to be flying nearly everywhere these days, coming and going at a record pace to the delight and relief of NASA, researchers and the space faring crews serving aboard the International Space Station (ISS). As one Dragon returned to Earth from space today, May 21, another Dragon prepares to soar soon to space. The commercial SpaceX-6 cargo Dragon successfully splashed down in the Pacific Ocean at 12:42 p.m. EDT (1642 GMT) today, Thursday, about 155 miles southwest of Long Beach, California, some five hours after it was released from the grip of the stations robotic arm this morning at 7:04 a.m. EDT by the Expedition 43 crew as the craft were flying some 250 miles (400 km) above Australia. The ocean splashdown marked the conclusion to the company’s sixth cargo resupply mission to the ISS under a commercial contract with NASA. Overall this was the seventh trip by a Dragon spacecraft to the station since the inaugural flight in 2012. Following the launch failure and uncontrolled destructive plummet back to Earth of the Russian Progress 59 cargo freighter earlier this month, the station and its six person international crews are more dependent than ever on the SpaceX commercial supply train to orbit to keep it running and humming with productive science. Working from a robotics work station in the domed cupola, NASA astronaut Scott Kelly released the Dragon CRS-6 spacecraft from the grappling snares of the 57.7-foot-long (17-meter-long) Canadian-built robotic arm with help from fellow NASA astronaut Terry Virts. Kelly is a member of the first 1 Year ISS mission crew, along with Russian cosmonaut Mikhail Kornienko. The capsule then performed an intricate series of three departure burns and maneuvers to move beyond the imaginary 656-foot (200-meter) “keep out sphere” around the station and begin its five and a half hour long trip back to Earth. The station crew had packed Dragon with almost 3,100 pounds of NASA cargo from the International Space Station. The including research samples pertaining to a host of experiments on how spaceflight and microgravity affect the aging process and bone health as well as no longer need items and trash to reduce station clutter. “Spaceflight-induced health changes, such as decreases in muscle and bone mass, are a major challenge facing our astronauts,” said Julie Robinson, NASA’s chief scientist for the International Space Station Program Office at NASA’s Johnson Space Center in Houston, in a statement. The Dragon was retrieved from the ocean by recovery boats following the parachute assisted splashdown. It will be transported to Long Beach, California for removal and return of the NASA cargo. The capsule itself will be shipped to SpaceX’s test facility in McGregor, Texas, for processing to remove cargo and inspection of its performance. Dragon splashes down into the Pacific Ocean, carrying 3,100 lbs of cargo and science for NASA on May 21, 2015, Credit: SpaceX. “The returning Space Aging study, for example, examines the effects of spaceflight on the aging of roundworms, widely used as a model for larger organisms,” noted NASA in a statement. Dragon departed after having spent a record setting stay of 33 days berthed to the station at an Earth facing port on the Harmony node. Dragon is also the only current US means for sending cargo to the station after the loss of the Orbital Sciences Cygnus craft in the Antares rocket explosion last October. The SpaceX CRS-6 Dragon successfully blasted off atop a Falcon 9 booster from Space Launch Complex 40 at Cape Canaveral Air Force Station in Florida on April 14, 2015 at 4:10 p.m. EDT (2010:41 GMT) on the CRS-6 (Commercial Resupply Services-6) mission. The resupply vessel had arrived three days later on April 17 and was successfully snared by the Expedition 43 Flight Engineer Samantha Cristoforetti of the European Space Agency, the first female Italian astronaut. Dragon launched on April 14 with more than 4,300 pounds of supplies, science experiments, and technology demonstrations, including critical materials to support about 40 of more than 250 science and research investigations during the station’s Expeditions 43 and 44. An Espresso machine was also aboard and delivered to enhance station morale during the daily grind some 250 miles above Earth. Among the research investigations were a fresh batch of 20 rodents for the Rodent Research Habitat, and experiments on osteoporosis to counteract bone deterioration in microgravity, astronaut vision loss, protein crystal growth, and synthetic muscle for prosthetics and robotics. Following the complete success of the SpaceX Dragon CRS-6 mission, NASA just announced that the next SpaceX Dragon is currently slated to launch on June 26 at 11:09 a.m. EDT. The Dragon will carry critical US equipment enabling docking by the SpaceX Crew Dragon and Boeing CST-100 astronaut transporters. Read Ken’s earlier onsite coverage of the CRS-6 launch from the Kennedy Space Center and Cape Canaveral Air Force Station. The spinning, out-of-control Russian Progress 59 cargo freighter met its undesired early demise when it fell from orbit early Friday, May 8, and was destroyed during the unplanned fiery plummet through the Earth’s atmosphere. As a result of the loss of the unmanned Progress 59 spacecraft, which was bound for the International Space Station (ISS) on a routine resupply mission, the timelines of upcoming crew rotations and new launches are “under evaluation” – Universe Today learned according to Russian and American space sources. The doomed Progress freighter “ceased to exist” after it reentered the Earth’s atmosphere 05.04 Moscow time on May 8, 2015 (10:04 p.m. EDT May 7) over the central Pacific Ocean,” according to an official statement from Roscosmos, the Russian Space Agency. The consequences of the failure might cause “postponements of upcoming station crew changes to June” and blastoffs “to July” according to Russian space industry and media sources. The vessel, also known as Progress M-27M, burned up minutes later and any surviving pieces fell over the Pacific Ocean. “Debris fell about 900 kilometers west of the Marquesas Islands in the central Pacific Ocean,” a space industry source told the Russian news agency TASS. “Roscosmos plans to adjust the program of flights to the International Space Station (ISS) due to the recent accident involving the Progress M-27M spacecraft,” according to the TASS rocket and space industry source. Roscosmos quickly established an investigation board to determine the cause of the Progress failure and any commonalities it might have with manned launches of the Soyuz rocket and capsule, and report back by 13 May. “The results of investigation of the incident related to “Progress M-27M” will be presented no later than 13 May following the completion of the state commission,” Roscosmos stated. Russian mission controllers lost control of the Progress 59 spacecraft shortly after its otherwise successful launch to the ISS on April 28 from the Baikonur space center in Kazakhstan atop a Soyuz-2.1A carrier rocket. NASA officials said that the current ISS Expedition 43 six person crew is in no danger. The station has sufficient supplies to last until at least September, even if no other supplies arrive in the meantime. 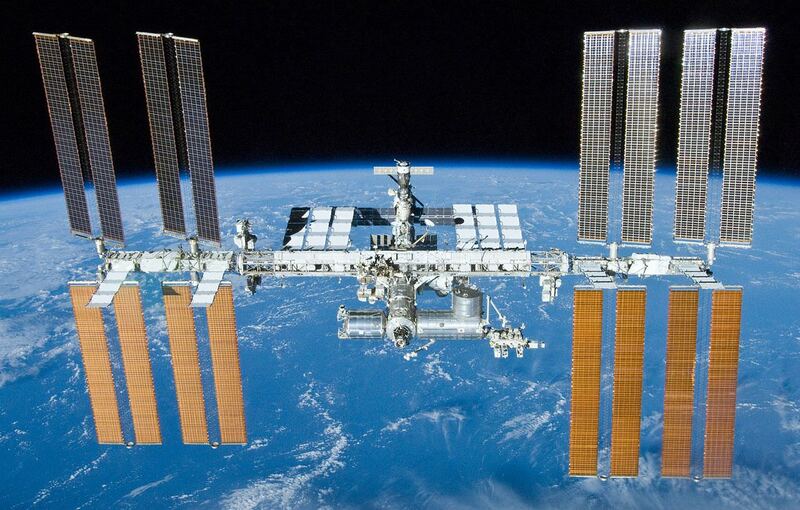 “The spacecraft was not carrying any supplies critical for the United States Operating Segment (USOS) of the station, and the break up and reenty of the Progress posed no threat to the ISS crew,” NASA said in a statement. There is a stock of propellants onboard in the Russian segment that can be used for periodically required station reboosts. “Not yet,” he said, answering a question on whether causes of the accident had been established. Because the cause of Progress failure is not yet clear, the schedules for upcoming crew departures and launches to the ISS via Russian Soyuz rockets and capsules are “under evaluation,” according to sources. There is a significant potential for a delay in the planned May 13 return to Earth of the three person crew international crew consisting of NASA astronaut and current station commander Terry Virts and flight engineers Samantha Cristoforetti of ESA (European Space Agency) and Anton Shkaplerov of Roscosmos, who have been aboard the complex since November 2014. They comprise the current Expedition 43 crew, along with the recently arrived crew of NASA astronaut Scott Kelly and Russian cosmonauts Mikhail Kornienko and Gennady Padalka who launched onboard a Soyuz capsule on March 27. Virts and his crewmates were due to head back to Earth in their Soyuz capsule on May 13. According to Russian sources, their return trip may be postponed to about June 11 to 13. “The return from orbit of the expedition which is currently there is suggested to be postponed from May 14 to June,” said a TASS source. Their three person replacement crew on Expedition 44 were due to blastoff on the next planned manned Soyuz launch on May 26 from the Baikonur Cosmodrome in Kazakhstan. This launch may now be delayed as well, to mid or late July. “The proposal was forwarded by a Roscosmos working group and has not been approved yet,” reports TASS. An official announcement by Roscosmos of any ISS schedule changes may come next week since the scheduled return of Virts crew is only days away. Another potential change is that the launch of the next unmanned Progress 60 (M-28M), could potentially be moved up from August to July, hinging on the outcome of the state commission investigation. To date flights of the Progress vehicle have been highly reliable. The last failure occurred in 2011, shortly after the retirement of NASA’s Space Shuttle orbiters in July 2011. The loss of the Progress did cascade into a subsequent crew launch delay later in 2011. The 7 ton Progress vehicle was loaded with 2.5 tons of supplies for the ISS and the six person Expedition 43 crew. Items included personal mail for the crew, scientific equipment, food, water, oxygen, gear and replaceable parts for the station’s life support systems. The next SpaceX Falcon 9 launch carrying the CRS-7 Dragon cargo ship on a resupply mission for NASA to the ISS is slated for mid-June. The most recent SpaceX Dragon was launched on the CRS-6 mission on April 14, 2015. At this time the SpaceX CRS-7 launch remains targeted for liftoff on June 19, 2015. The first critical test flight of SpaceX’s crewed Dragon that will soon launch American astronauts back to orbit and the International Space Station (ISS) from American soil is now less than two days away. The test flight – called the Pad Abort Test – is slated for the early morning hours of Wednesday, May 6, if all goes well. The key facts and a timeline of the test events are outlined herein. The test vehicle will reach roughly a mile in altitude (5000 feet, 1500 meters) and last only about 90 seconds in duration from beginning to end. It constitutes a crucial first test of the crew capsule escape system that will save astronauts lives in a split second in the unlikely event of a catastrophic launch pad failure with the Falcon 9 rocket. The May 6 pad abort test will be performed from the SpaceX Falcon 9 launch pad from a platform at Space Launch Complex 40 (SLC-40) at Cape Canaveral Air Force Station, Florida. The test will not include an actual Falcon 9 booster. SpaceX has just released new images showing the Dragon crew capsule and trunk section being moved to the launch pad and being positioned atop the launch mount on SLC-40. See above and below. Together the Dragon assembly stands about 20 feet (5 meters) tall. A test dummy is seated inside. And SpaceX now says the dummy is not named “Buster” despite an earlier announcement from the company. “Buster the Dummy already works for a great show you may have heard of called MythBusters. Our dummy prefers to remain anonymous for the time being,” SpaceX said today. So, only time will tell if that particular mission fact will ever be revealed. The test window opens at 7 a.m. EDT May 6 and extends until 2:30 p.m. EDT into the afternoon. The webcast will start about 20 minutes prior to the opening of the window. NASA will also provide periodic updates about the test at their online Commercial Crew Blog. The current weather forecast predicts a 70% GO for favorable weather conditions during the lengthy test window. Since the Pad Abort Test is specifically designed to be a development test, in order to learn crucial things about the performance of the escape system, it doesn’t have to be perfect to be valuable. And delays due to technical issues are a very significant possibility. The test is critical for the timely development of the human rated Dragon that NASA is counting on to restore the US capability to launch astronauts from US soil abroad US rockets to the International Space Station (ISS) as early as 2017. Here’s a graphic illustrating the May 6 SpaceX Pad Abort Test trajectory and sequence of planned events. The Crew Dragon will accelerate to nearly 100 mph in barely one second. The test will last less than two minutes and the ship will travel over one mile in the first 20 seconds alone. The pad abort demonstration will test the ability of a set of eight SuperDraco engines built into the side walls of the crew Dragon to pull the vehicle away from the launch pad in a split second in a simulated emergency to save the astronauts lives in the event of a real emergency. The SuperDraco engines are located in four jet packs around the base. Each engine produces about 15,000 pounds of thrust pounds of axial thrust, for a combined total thrust of about 120,000 pounds, to carry astronauts to safety. The eight SuperDraco’s will propel Dragon nearly 100 meters (328 ft) in 2 seconds, and more than half a kilometer (1/3 mi) in just over 5 seconds. T-0: The eight SuperDracos ignite simultaneously and reach maximum thrust, propelling the spacecraft off the pad. T+.5s: After half a second of vertical flight, Crew Dragon pitches toward the ocean and continues its controlled burn. The SuperDraco engines throttle to control the trajectory based on real-time measurements from the vehicle’s sensors. T+5s: The abort burn is terminated once all propellant is consumed and Dragon coasts for just over 15 seconds to its highest point about 1500 meters (.93 mi) above the launch pad. T+21s: The trunk is jettisoned and the spacecraft begins a slow rotation with its heat shield pointed toward the ground again. T+25s: Small parachutes, called drogues, are deployed first during a 4-6 second window following trunk separation. T+35s: Once the drogue parachutes stabilize the vehicle, three main parachutes deploy and further slow the spacecraft before splashdown. T+107s: Dragon splashes down in the Atlantic Ocean about 2200 meters (1.4 mi) downrange of the launch pad. “This is what SpaceX was basically founded for, human spaceflight,” said Hans Koenigsmann, vice president of Mission Assurance with SpaceX. The pusher abort thrusters would propel the capsule and crew safely away from a failing Falcon 9 booster for a parachute assisted splashdown into the Ocean. Koenigsmann notes that the SpaceX abort system provides for emergency escape all the way to orbit, unlike any prior escape system such as the conventional launch abort systems (LAS) mounted on top of the capsule. The next Falcon 9 launch is slated for mid-June carrying the CRS-7 Dragon cargo ship on a resupply mission for NASA to the ISS. On April 14, a flawless Falcon 9 launch boosted the SpaceX CRS-6 Dragon to the ISS. There was no attempt to soft land the Falcon 9 first stage during the most recent launch on April 27. Due to the heavy weight of the TurkmenÄlem52E/MonacoSat satellite there was not enough residual fuel for a landing attempt on SpaceX’s ocean going barge. The next landing attempt is set for the CRS-7 mission. SpaceX set a new internal record pace for time between blastoffs of their workhorse Falcon 9 rocket with Monday’s spectacular dusky liftoff of Turkmenistan’s first satellite into heavily overcast skies that has cleared the path ahead for a busy manifest of critical flights starting with a critical pad abort test for NASA just a week from today. After a 49 minute delay due to grim weather conditions, weather officials finally found a “window in the clouds” that permitted the Falcon 9 to launch on Monday, April 27, 2015 at 7:03pm EDT (2303 GMT). The launch took place just 13 days after successfully launching the SpaceX Dragon CRS-6 resupply freighter to the International Space Station (ISS) for NASA on April 14. Overall this launch marked Falcon 9’s fifth launch in four months and second in 13 days, besting SpaceX’s previous turnaround record by one day. But it was touch and go all afternoon, when two weather rules related to cloudy conditions violated the launch commit criteria and forced a no go from the originally planned 6:14 liftoff time. The situation was not at all promising when the weather officer announced “NO GO” during the prelaunch poll that resulted in a recycle to the T minus 20 minute mark with seemingly little prospect of a launch. Then all of a sudden, conditions improved and the count was resumed and “wet off without a hitch” said SpaceX. The 224 foot tall SpaceX Falcon 9 launched on a commercial mission for Thales Alenia Space carrying the first ever communications satellite for the nation of Turkmenistan. The TurkmenÄlem52E/MonacoSat satellite was built by Thales Alenia Space. The 14 story Falcon 9 first stage is powered by 9 Merlin 1D engines that generate about 1.3 million pounds of thrust. The Falcon 9’s first and second stages separated three minutes after launch. The second stage fired for six minutes for its first burn to reach the initial parking orbit. It then reignited twenty-six minutes into flight, to completed a one-minute burn. The launch delivered the 10,375-pound (4500 kg) TurkmenÄlem52E/MonacoSat satellite to a geosynchronous transfer orbit. The satellite was deployed as planned approximately 32 minutes after liftoff. Launches are never easy, as exemplified by a post launch tweet from SpaceX CEO Elon Musk after the satellite was deployed from the second stage. ‘Rocket launch good, satellite in geo transfer orbit. Still so damn intense. Looking fwd to it feeling normal one day,” tweeted Musk. Despite the launch of Turkmenistan’s first communications satellite, the country is conducting a war on satellite dishes to receive the signals according to Human Rights Watch. Just 1 week from today on May 5, SpaceX plans a pad abort test for NASA that is critical for the timely development of the human rated Dragon that NASA is counting on to restore the US capability to launch astronauts from US soil to the space station. The next Falcon 9 launch is slated for mid-June carrying the CRS-7 Dragon cargo ship on a NASA mission to the ISS. There was no attempt to soft land the Falcon 9 first stage during the April 27 launch. Due to the heavy weight of the TurkmenÄlem52E/MonacoSat satellite there was not enough residual fuel for a landing attempt on SpaceX’s ocean going barge. As promised, SpaceX is picking up its launch pace in 2015 with a pair of liftoffs from the Florida space coast slated for the next week and a half. They follow closely on the heels of a quartet of successful blastoffs from Cape Canaveral, already accomplished since January. If all goes well, a commercial satellite launch and a human spaceflight related pad abort test launch for NASA are scheduled for April 27 and May 5 respectively. Mondays launch of a communications satellite for Thales Alenia Space takes place just 13 days after SpaceX successfully launching the Dragon CRS-6 resupply freighter to the International Space Station (ISS) for NASA on April 14. The 13 day turnaround time will mark a new launch cadence record for SpaceX if the weather and rocket cooperate, eclipsing the 14 day turnaround record set last September. The 224 foot tall SpaceX Falcon 9 rocket is scheduled to launch at approximately 6:14 p.m. EDT (2214 GMT) on April 27 from Space Launch Complex 40 (SLC-40) at Cape Canaveral Air Force Station, Florida. It will deliver the TurkmenÄlem52E/MonacoSat satellite to a geosynchronous transfer orbit. This first satellite ever for Turkmenistan will be deployed approximately 32 minutes after liftoff of the fifth Falcon 9 rocket this year. The outlook is currently 60 percent GO for favorable weather conditions at launch time. The May 5 pad abort test for NASA is critical for the timely development of the human rated Dragon that NASA is counting on to restore the US capability to launch astronauts from US soil to the space station. The test will simulate an emergency abort from a test stand and will also take place from the Cape’s Space Launch Complex 40 in Florida. SpaceX has a four hour launch window in which to conduct the test. The test window opens at 9:30 a.m. EDT (1330 GMT) on May 5. There is a backup opportunity on May 6. The pad abort demonstration will test the ability of a set of eight SuperDraco engines built into the side walls of the crew Dragon to pull the vehicle away from the launch pad in a split second in a simulated emergency. 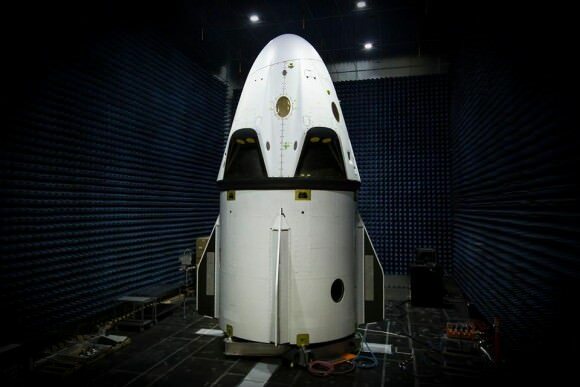 First look at the SpaceX Crew Dragon’s pad abort vehicle set for flight test in March 2014. Credit: SpaceX. The purpose is to test the ability of the abort system to save astronauts lives in the event of a real emergency. The SuperDraco engines are located in four jet packs around the base. Each enigne can produce up to 120,000 pounds of axial thrust to carry astronauts to safety, according to a SpaceX description. Here is a SpaceX video of SuperDraco’s being hot fire tested in Texas. The pad abort test is being done under SpaceX’s Commercial Crew Integrated Capability (CCiCap) agreement with NASA. The initial pad abort test will test the ability of the full-size Dragon to safely push away and escape in case of a failure of its Falcon 9 booster rocket in the moments around launch, right at the launch pad. “The purpose of the pad abort test is to demonstrate Dragon has enough total impulse (thrust) to safely abort,” SpaceX spokeswoman Emily Shanklin informed me. For that test, Dragon will use its pusher escape abort thrusters to lift the Dragon safely away from the failing rocket. The vehicle will be positioned on a structural facsimile of the Dragon trunk in which the actual Falcon 9/Dragon interfaces will be represented by mockups. The test will not include an actual Falcon 9 booster. A second Dragon flight test follow later in the year. It involves simulating an in flight emergency abort scenario during ascent at high altitude at maximum aerodynamic pressure at about T plus 1 minute, to save astronauts lives. The pusher abort thrusters would propel the capsule and crew safely away from a failing Falcon 9 booster for a parachute assisted landing into the Atlantic Ocean. The SpaceX Dragon V2 and Boeing CST-100 vehicles were selected by NASA last fall for further funding under the auspices of the agency’s Commercial Crew Program (CCP), as the worlds privately developed spaceships to ferry astronauts back and forth to the International Space Station (ISS). Both SpaceX and Boeing plan to launch the first manned test flights to the ISS with their respective transports in 2017. During the Sept. 16, 2014 news briefing at the Kennedy Space Center, NASA Administrator Charles Bolden announced that contracts worth a total of $6.8 Billion were awarded to SpaceX to build the manned Dragon V2 and to Boeing to build the manned CST-100. There will be no attempt to soft land the Falcon 9 first stage during the April 27 launch. The next landing attempt is set for mid-June. KENNEDY SPACE CENTER, FL – Following the flawless blastoff of the SpaceX Falcon 9 booster and Dragon cargo ship on Tuesday, April 14, the resupply vessel arrived at the International Space Station today, April 17, and was successful snared by the outposts resident ‘Star Trek’ crewmate, Expedition 43 Flight Engineer Samantha Cristoforetti of the European Space Agency, donning her futuristic outfit from the famed TV show near and dear to space fans throughout the known galaxy! Cristoforetti grappled the SpaceX Dragon freighter with the station’s robotic arm at 6:55 a.m. EDT, with the able assistance of fellow crewmate and Expedition 43 Commander Terry Virts of NASA. Dragon is hauling critical supplies to the six astronauts and cosmonauts serving aboard, that now includes the first ever ‘One-Year Mission’ crew comprising NASA’s Scott Kelly and Russia’s Mikhail Kornienko. Cristoforetti and Virts were manipulating the 57.7-foot-long (17-meter-long) Canadian-built robotic arm while working inside the stations seven windowed domed Cupola, that reminds many of Darth Vader’s lair in ‘Star Wars’ lore. The SpaceX Dragon blasted off atop a Falcon 9 booster from Space Launch Complex 40 at Cape Canaveral Air Force Station in Florida on April 14, 2015 at 4:10 p.m. EDT (2010:41 GMT) on the CRS-6 (Commercial Resupply Services-6) mission bound for the space station. The Dragon cargo spacecraft was berthed to the Earth facing port of Harmony module of the International Space Station at 9:29 a.m. EDT. The entire multihour grappling and berthing operations were carried live on NASA TV, for much of the morning and everything went smoothly. The crew plans to open the hatch between Dragon and the station on Saturday. Dragon is loaded with more than 4,300 pounds of supplies, science experiments, and technology demonstrations, including critical materials to support about 40 of more than 250 science and research investigations during the station’s Expeditions 43 and 44. Among the research investigations are a fresh batch of 20 rodents for the Rodent Research Habitat, and experiments on osteoporosis to counteract bone deterioration in microgravity, astronaut vision loss, protein crystal growth, and synthetic muscle for prosthetics and robotics. An Espresso machine is also aboard to enhance station morale during the daily grind some 250 miles above Earth. Following the April 14 launch, SpaceX made a nearly successful soft landing of the first stage on an ocean floating platform in the Atlantic Ocean. Read my story – here. KENNEDY SPACE CENTER, FL – A new high resolution video from SpaceX shows just how close the landing attempt of their Falcon 9 first stage on an ocean floating barge came to succeeding following the rockets launch on Tuesday afternoon, April 14, from Cape Canaveral, Florida, on a resupply run for NASA to the International Space Station (ISS). The SpaceX Falcon 9 carrying the Dragon cargo vessel blasted off from Space Launch Complex 40 at Cape Canaveral Air Force Station in Florida on April 14, 2015 at 4:10 p.m. EDT (2010:41 GMT) on the CRS-6 mission bound for the space station. The flawless Falcon 9 liftoff came a day late following a postponement from Monday, April 13, due to threatening clouds rolling towards the launch pad in the final minutes of the countdown. See an up close video view of the launch from a pad camera, below. The dramatic hi res landing video was released by SpaceX CEO Elon Musk. It clearly reveals the deployment of the four landing legs at the base of the booster as planned in the final moments of the landing attempt, aimed at recovering the first stage booster. By about three minutes after launch, the spent fourteen story tall first stage had separated from the second stage and reached an altitude of some 125 kilometers (77 miles) following a northeastwards trajectory along the U.S. east coast. SpaceX engineers relit a first stage Merlin 1D engine some 200 miles distant from the Cape Canaveral launch pad to start the process of a precision guided descent towards the barge, known as the ‘autonomous spaceport drone ship’ (ASDS). It had been pre-positioned offshore of the Carolina coast in the Atlantic Ocean. SpaceX initially released a lower resolution view taken from a chase plane captured dramatic footage of the landing. “Looks like Falcon landed fine, but excess lateral velocity caused it to tip over post landing,” tweeted SpaceX CEO Elon Musk. The Falcon successfully reached the tiny ocean floating barge in the Atlantic Ocean, but tilted over somewhat over in the final moments of the approach, and tipped over after landing and exploded in a fireball. The next landing attempt is set for the SpaceX CRS-7 launch, currently slated for mid- June, said Hans Koenigsmann, SpaceX Director of Mission assurance, at a media briefing at KSC. The 20 story tall Falcon 9 hurled Dragon on a three day chase of the ISS where it will rendezvous with the orbiting outpost on Friday, April 17. Astronauts will grapple and berth Dragon at the station using the robotic arm. KENNEDY SPACE CENTER, FL – After a 24 hour delay due to threatening clouds, a SpaceX Falcon 9 rocket soared spectacularly to orbit from the Florida Space coast today, April 14, carrying a Dragon on a science supply run bound for the the International Space Station that will help pave the way for deep space human missions to the Moon, Asteroids and Mars. See the video of the launch, below. SpaceX will continue with attempt to soft land and recover the rocket on upcoming launches, which was a secondary goal of the company. SpaceX released some imagery and video with a few hours of the landing attempt. The Falcon 9 first stage was outfitted with four landing legs and grid fins to enable the landing attempt, which is a secondary objective of SpaceX. The top priority was to safely launch the Falcon 9 and deliver critical supplies to the station with the Dragon cargo vessel. “Five years ago this week, President Obama toured the same SpaceX launch pad used today to send supplies, research and technology development to the ISS,” said NASA Administrator Charles Bolden. A chase plane captured dramatic footage of the landing on the ocean going platform known as the ‘autonomous spaceport drone ship’ (ASDS). It was pre-positioned some 200 to 250 miles offshore of the Carolina coast in the Atlantic Ocean along the rockets flight path flying along the US Northeast coast to match that of the ISS. After a three day orbital chase, the Dragon spacecraft with rendezvous with the million post Earth orbiting outpost Friday morning April 17. After SpaceX engineers on the ground maneuver the Dragon close enough to the station, European Space Agency (ESA) astronaut Samantha Cristoforetti will use the station’s 57.7-foot-long (17-meter-long) robotic arm to reach out and capture Dragon at approximately 7 a.m. EDT on April 17. Terry Virts, as they work inside the stations seven windowed domed cupola to berth Dragon at the Earth-facing port of the Harmony module.